More Royals? Yes, please! I cannot get enough of these characters! You have no idea how excited I was when I received the email announcing eARCs. I swear I must have responded within 20 seconds or so. LOL I love this trilogy that much! If you read PAPER PRINCESS, book 1 in the trilogy, you know how cruel that cliffhanger was! I was so mad and heartbroken! That was NOT how things were supposed to play out. Luckily for us, BROKEN PRINCE picks up right where PAPER PRINCESS left off. Don’t continue reading unless you have already read PAPER PRINCESS. If you read PAPER PRINCESS, book 1 in The Royals trilogy, you know how cruel that cliffhanger was! I was so mad and heartbroken! That was NOT how things were supposed to play out. Luckily for us, BROKEN PRINCE picks up right where PAPER PRINCESS left off. 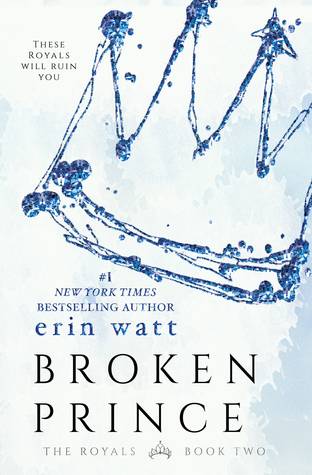 Broken Prince is also told in both Ella and Reed’s POV with alternating chapters, which I totally love because I am able to get into Reed’s head. We get to know all the characters a little more and some juicy secrets are revealed. Except one that has been driving me crazy, and that's the whole story behind the Royal twins! LOL We get to see more high school drama, which is the one thing that made the story drag. I wanted more of Ella and Reed. Those two really get my heart pumping! There were some scenes in there that had me fanning myself. LOL I just love Elle and Jen so much! There are a few things that I am hoping will be revealed in Twisted Palace. Overall BROKEN PRINCE was amazing and I can’t wait to read TWISTED PALACE! Especially with that jaw dropping cliffhanger! I really hadn't expected that to happen. I NEED TWISTED PALACE NOW!!!! I'm excited that you posted this review. I am looking forward to reading it. I just pre-ordered it. I have to say I'm a little jealous you got an ARC.